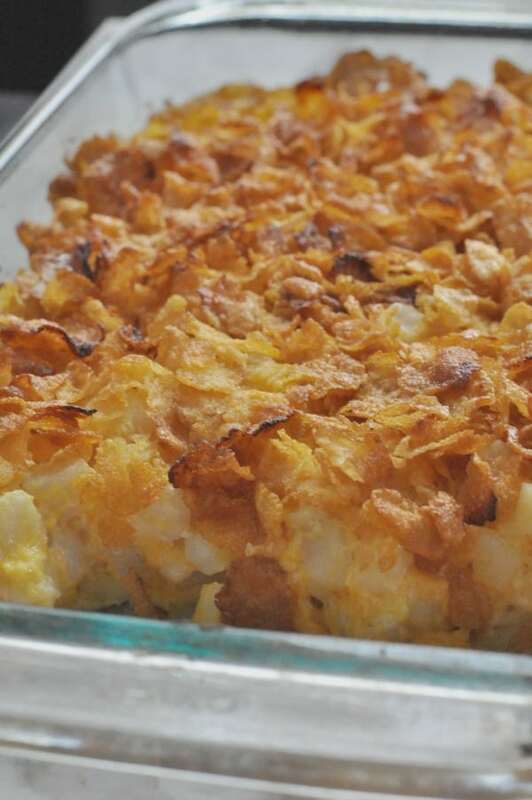 Classic Corn Flakes Potato Cheesy Casserole recipe made with cubed hash browns, cheese and sour cream. The perfect side dish for family events! 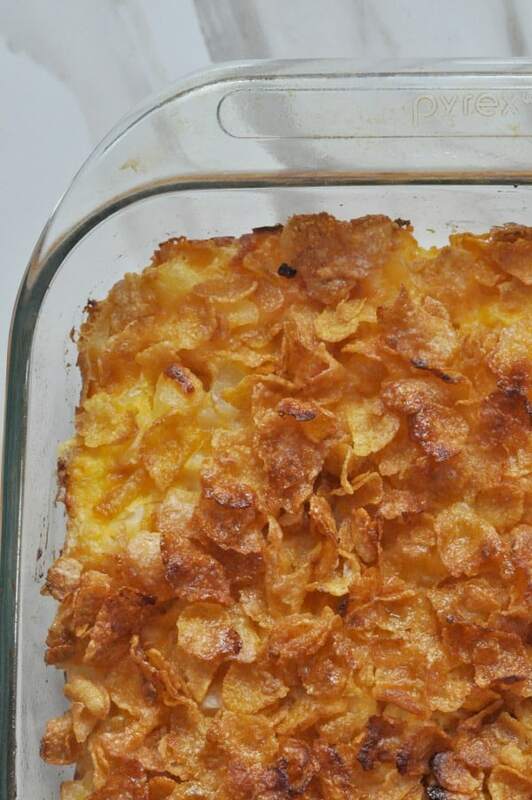 I have a super simple classic holiday casserole side dish recipe for you, Corn Flakes potato casserole. 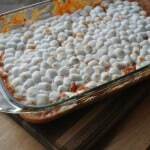 This is one of our family’s favorite side dishes for holidays and Sunday meals. 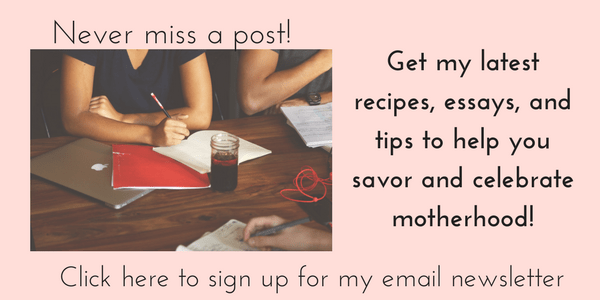 I’m going to show you how to put this super simple casserole together that you can serve or bring to your next family get together. Kids and adults love this cheesy classic! Let the oven do all the work for this family-favorite side dish. 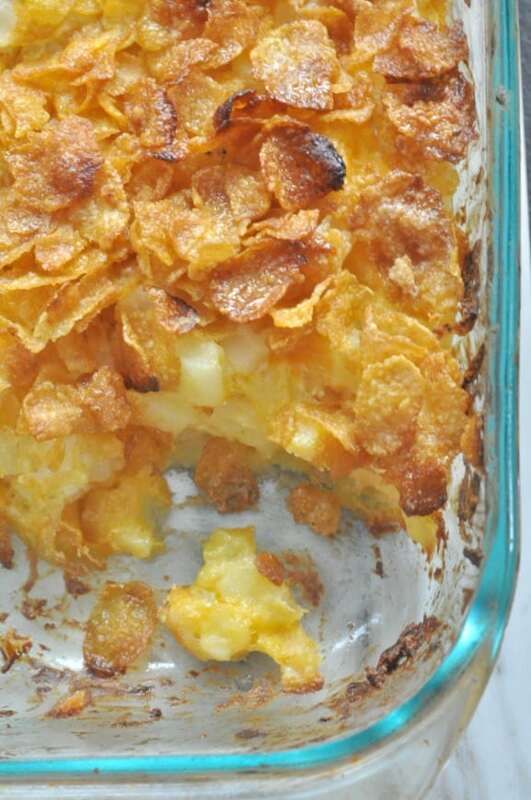 My Corn Flakes Potato casserole is simple to put together and the oven does all the work. 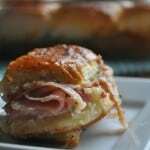 Simple, easy to find ingredients, no prep work. Just mix up all the ingredients, spread in a pan, top with the corn flakes and bake. Simple. Most Corn Flakes potato casserole recipes will call for cream of mushroom, I substitute canned cheese sauce (available right next to the cream of mushroom). It gives it an extra cheesy boost that everyone also loves. 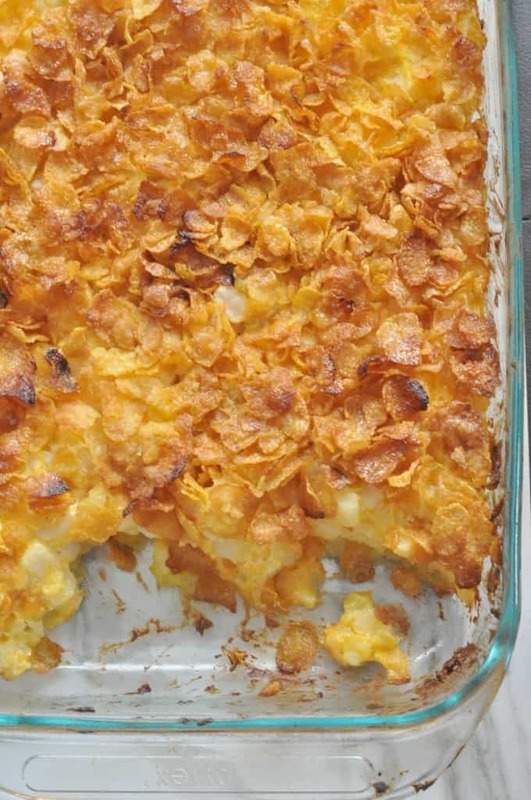 Instead of corn flakes, try frosted flakes, the sugary cereal gives a sweet balance to the savory casserole. 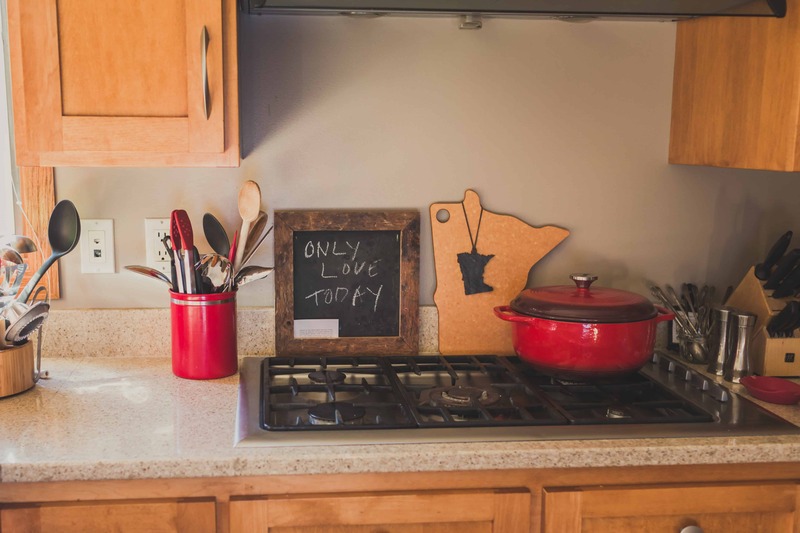 Keep an eye on your casserole, since oven temps can differ, if your topping starts to brown too fast, just put a piece of tin foil on top to keep from burning. During holidays, I love when I can put together something so simple and actually take in the holiday. 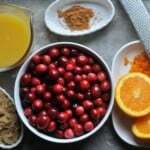 I don’t like to stress about finding special ingredients and putting together something difficult. I just want a classic that I know my whole family will love. I’ve been enjoying this casserole since I was a kid and I hope you and your family enjoy this simple casserole and have a great holiday with full bellies and hearts! Need an easy main dish? 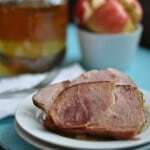 You’ll love the Corn Flakes Potato Casserole with my slow cooker crock-pot ham! 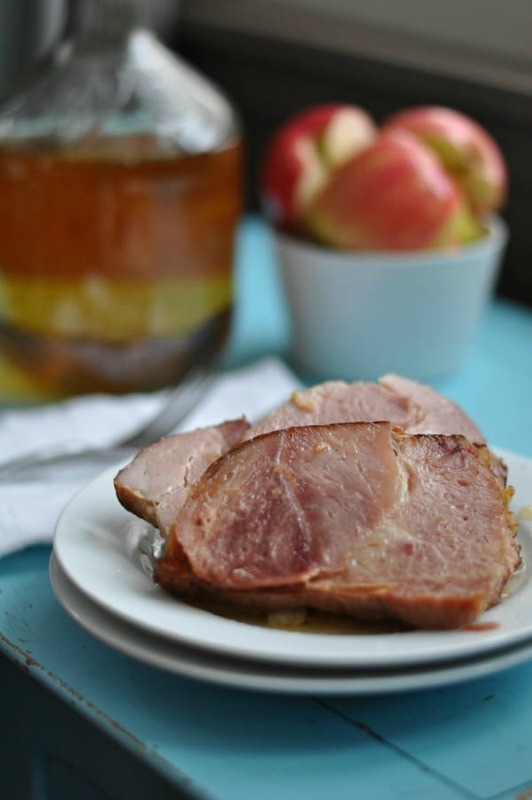 Perfect for a holiday meal or Sunday dinner with family. In a large bowl, combine potatoes, cheddar soup, sour cream, cheddar cheese, salt and 6 TB of the melted butter. Set aside. In a medium-sized bowl, combine cereal and remaining 6 TB of melted butter. Set aside. Spread potato mixture in the 9x13 pan. Top with cereal. Bake for 1 hour and 5 minutes covered with aluminum foil. Remove foil and bake 10 minutes or until cereal is lightly browned. 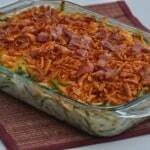 This entry was posted in Comfort Foods, Holiday, sidedish and tagged casserole, christmas, Corn Flakes, easter, easy, Hash Browns, kids, Potato, side dish, Sides, Thanksgiving by Alice Seuffert. Bookmark the permalink. Do you put the hashbrowns in frozen? or thawed out? can you use the fresh O’Brien ones? Hi Cindy! I use frozen potatoes. 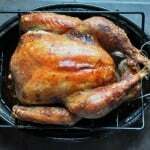 If you use thawed or fresh ones, you can likely decrease the cooking time. Thanks for writing, enjoy! Can you use normal shredded hash browns instead of cubed? Hannah, I really like the cubed potatoes best for taste and texture. I used frozen shredded hash browns instead of cubed and it turned out just fine! This sounds amazing! My husband really hates sour cream are there any recommendations you have that I could use in place of the sour cream? My husband hates sour cream, too! He does really like these potatoes. I haven’t tried it, but I know people sometimes substitute plain yogurt for sour cream. Can I make this the night before and refrigerate it? Hi Sherri! I use frozen potatoes and make it the day of, I haven’t made it the day before. I think it would work, the potatoes may lose some texture and you could likely decrease the cook temp. Good luck!